With just two tables and a slightly longer format, yesterday saw the start of the “business end” of this rear Scottish Open in Glasgow. Two matches were played in the afternoon, both very one-sided affairs with the highest ranked players winning easily, and two in the evening, a bit more eventful. 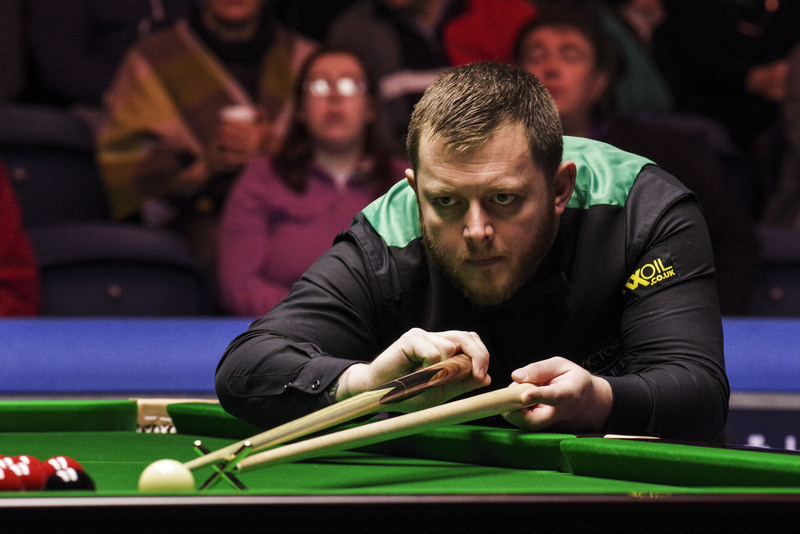 Shaun Murphy and Mark Allen both whitewashed their respective opponents. But Ryan Day was well beaten by Daniel Wells who has now booked his place in his first semi-final in a ranking event, and Stuart Carrington gave Judd Trump a good game. Mark Allen is through to the semi-finals of the BetVictor Scottish Open after a 5-0 whitewash victory against Alfie Burden in Glasgow. The Pistol is enjoying one of the most consistent runs of his career, having won 18 of his last 20 ranking event matches. He produced a blistering display of break building power in winning the International Championship last month. Allen fired in 14 century breaks on his way to picking up the title. Burden, who is celebrating his 42nd birthday today, secured one of the biggest wins of his career yesterday. He defeated home favourite and four-time World Champion John Higgins 4-2. However, he couldn’t follow up that display this afternoon. Allen compiled breaks of 52, 86 and 61 on his way to a routine victory in just over an hour and a half. Allen said: “It was solid rather than spectacular. I feel for Alfie a little bit, as he missed some pots that he shouldn’t have. I just picked up the pieces, kept it tight when I needed to and didn’t make many errors. Allen will face Welshman Daniel Wells up next, who emphatically defeated compatriot Ryan Day 5-1 to reach his first ever ranking event semi-final. Wells received a first round bye after his opponent, the winner of last week’s UK Championship Ronnie O’Sullivan, pulled out of the event. The Neath potter has taken full advantage, only dropping three frames on his way to the last four. He showed no sign of finishing line nerves this evening. From 2-1 up he fired in breaks of 76, 54 and 71 to emerge with the 5-1 victory. 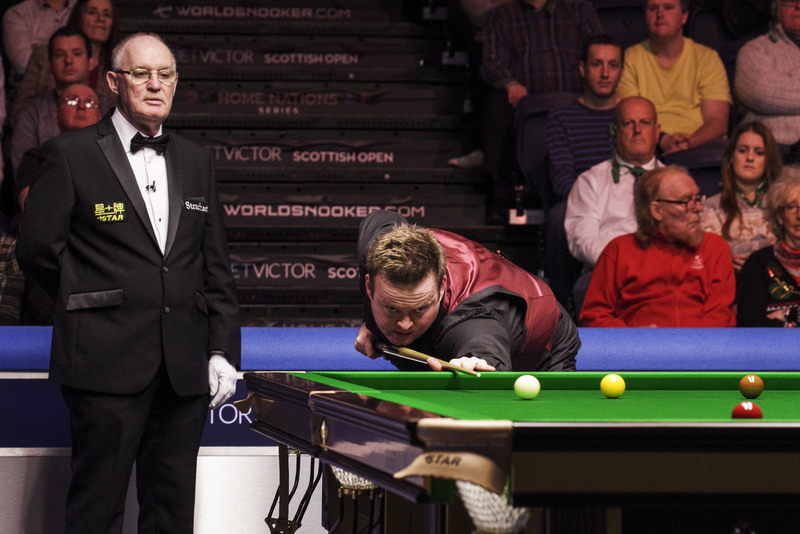 Shaun Murphy claimed his place in the last four with a 5-0 whitewash of Sam Baird. The Magician is enjoying an upturn in form this week, having lost six first round matches this season. Murphy is now potentially just two games away from a first ranking title since the 2017 Gibraltar Open. Murphy faces a blockbuster last four clash with Judd Trump. The Ace in the Pack negotiated a tough test from Stuart Carrington to come through 5-3. Trump produced three century runs of 101, 117 and 119 on his way to this evening’s victory. Ronnie was again in the ES studio, as well as in the commentary box. Ronnie was commentating on the Trump v Carrington match and here is the link. As for the semi finals, here are my views. Mark Allen faces Daniel Wells and I think that Mark will have too much for Daniel over best of eleven, on the main table. My prediction is that Mark will win with a bit in hand, by 6-2 or 6-3. In the other semi-final Shaun Murphy and Judd Trump should provide a much closer match. Should. Shaun played much better yesterday, and Judd has looked vulnerable when Stuart Carrington came back at him from 2-0 down to 2-2, then staying with him for 3-3. Actually, Judd revealed in his postmatch interview how much the presence and support of his brother Jack is helping him in moments like this, when doubts start to creep in. I can’t really call this match. Shaun plays an attacking game, which suits Judd better than Stuart’s more methodical approach, although Stuart was certainly not negative yesterday. But on the other hand, it means that both will give the other opportunities and it will very much be on the form of the day.